In addition to the 7.8-inch InkBook Explore that recently went up for pre-order, InkBook has also released a new 6-inch entry-level ebook reader called the InkBook Lumos. Basically it looks like they took the InkBook Classic 2 and added a frontlight with adjustable color temperature. Otherwise the specs and design appear the same, except the Lumos has a USB-C port. Another difference is the InkBook Lumos runs Android 4.4.2 instead of Android 4.2.2. Update: Their initial specs were wrong. It turns out it doesn’t have a USB-C port and it runs Android 4.2.2. The device has a dual-core 1.0GHz processor with 512MB of RAM and 4GB of storage space. It has Wi-Fi and a 2000 mAh battery. Plus it has a microSD card slot that supports cards up to 32GB. 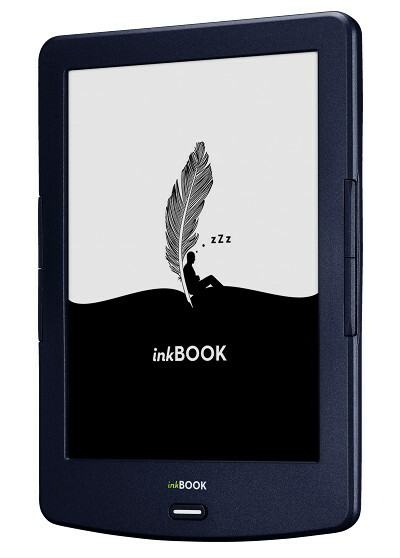 Like the InkBook Classic 2, the InkBook Lumos has a 6-inch E Ink Carta display with a resolution of 800 x 600 (167 ppi). Almost all frontlit ebook readers have at least 212 ppi so the low resolution is a downer but it does add the temperature control for the frontlight and it’s an entry-level model so it’s not very expensive. The native reading app supports EPUB and PDF formats, including Adobe DRM, as well as MOBI, TXT, FB2, HTML, RTF, and CHM formats. The device supports the following languages: English, German, Spanish, French, Italian, Polish, Romanian and Czech. The InkBook Lumos is currently selling from the InkBook website for €99. The regular price is €109. They’ve also started selling the InkBook Lumos on Amazon for $99 as well. Will you be getting one for a review? Yeah, I’ll order one when it turns up on Amazon. A new reader 800 x 600? Seems like they haven’t noticed it’s already 2018, not 2011 when Nook Simple Touch was released with the same resolution. Indeed, but at least they’re using a Carta screen instead of a Pearl screen like the basic Kindle has. I can’t believe Amazon is still using the same screen that the Kindle 3 came with in 2010.